A while back Debra and I discussed our mutual desire to learn the fine art of cake decorating. I had visions of making toy car cakes, and Barbie cakes in my future, perhaps finding great skill and having a friend with a tight budget ask me to help with a wedding cake. I have always loved art, and we all know I love to cook, so this should be a natural, right? 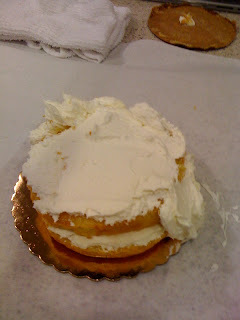 In case you hadn't figured it out, the image above is my cake, mid frosting. I do have to point out that it ended up much better than that. Maybe not a LOT better, but some amount better than the aforementioned image. I guess I have a while to go before I am crafting wedding cakes. But I have purchased the necessary equipment to make a mean cake, so if you need one for something, preferably a retirement party of someone with some seriously impaired vision, I'm your gal. Both surprisingly and happily, I have had requests for more recipes on my blog! This happens to be one of my favorite things to discuss, but I always thought that my loyal audience was bored to tears by it. Guess I was wrong! So I have a recipe of the day...make if for dinner if you don't already have a plan. It is a fantastic, lighter version of Chicken Piccata, and has become a staple in the Frank household. 1. Lay the chicken between two pieces of waxed paper and flatten the cutlet with the flat end of a mallet until thin. 3. Sauté the chicken over high heat, about 3 minute on each side. Remove to a warm platter and keep warm. You should post chicken in a pot too. That one's super easy and yummy. My favorite cookbook is still the one you made for me it's better than anything else I own. hi...you don't know me but I came across your blog and love it. I too want to be an awesome cake decorater. More or less so I can make awesome cakes for future birthdays of kids. Where did you get your cake decorating stuff??? That's awesome! I love that you read my blog! Send it on to others! I actually got the cake decorating supplies at Target, in the pans area. They also have them at Michael's craft stores.